Handel's Messiah, recorded live in the Robert and Margrit Mondavi Center for the Performing Arts on the campus of UC Davis. Released by Delos International. "For those who treasure Messiah, Thomas' version is revelatory." 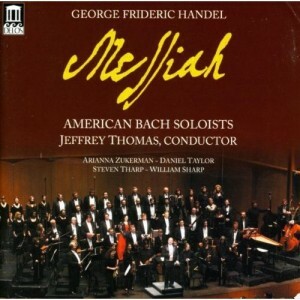 "One of the best-sounding recordings I've heard in the last few years is Handel's Messiah performed by Jeffrey Thomas and the American Bach Soloists (Delos DE-3360 CD). The sound is spectacularly natural, with realistic dynamics and a wonderful sense of space. If you haven't heard it, I recommend it highly."